Yeah, yeah, I know Tuesday isn’t “the middle of the week”, but consider our Thursdays are devoted to a card from years gone by, it’s about as middle of the week as it gets around here. That’s not important, what IS important though is probably how crazy this promo card is – and I’m not kidding, this is legitimately one of the craziest promo cards I’ve seen. Lucario-GX is a Stage 1 Fighting Pokemon, 210 HP, with a Psychic Weakness, no Resistance, and a Retreat Cost of 2. His first attack is Aura Strike, which does 1-for-30 unless you evolved it from a Riolu this turn, in which case it adds on 90 more damage for 120. 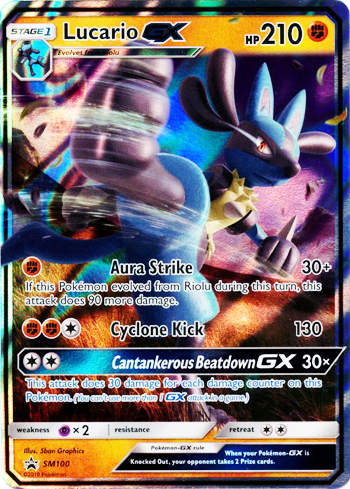 Cyclone Kick then is a 3-for-130 vanilla strike, and his GX Attack, Cantankerous Beatdown GX – aside from being a total mouthful – is a 2-Energy move that does 30 damage for every damage counter Lucario-GX has on him. Okay, so first off, Aura Strike – sure most of the time it’s a generic little pat on the back, but for that one turn Lucario-GX is evolved from Riolu, it’s a monster of an attack for 1 Energy. 30 damage base plus 90 damage from Riolu evolution is just the tip of the iceberg – add on a Choice Band for 30 more, and you’ve hit 150 damage, enough to KO most evolving non-EX/GX Pokemon. Have that one Energy be Strong Energy, and you’re swinging for up to 170 damage – enough to ACTUALLY KO some of those Basic-EX/GX. All this, for just one Energy. That is insane! Cyclone Kick is also a really solid move, which on its own can be enough to 2HKO most anything in the game right now that doesn’t resist it, and that Choice Band/Strong Energy could easily bypass Resistance reduction. And then you get to Cantankerous Beatdown-GX, which is one of those few GX attacks that costs less than one of the attacks of the Pokemon-GX it’s on! And then the order becomes apparent – Aura Strike Turn 1, Cantankerous Beatdown-GX Turn 2, and Cyclone Kick Turn 3 for at least 1-2 KOs and a set-up for a possible 3rd, thus practically winning the game. Once Lucario-GX gets rolling, it becomes very hard to stop him. That being said, Cantankerous Beatdown-GX is a heck of a move to throw at your opponent, but it needs at least 9 damage counters on its own to OHKO anything – maybe 8 if Choice Band or Strong Energy is attached. Not everything is going to hit Lucario-GX for such a substantial amount in the early game, but I think at that point you can Guzma out another Lucario-GX that just evolved off of a Riolu and smack down whatever you bring out, which means that’s a potential of 1-2 easy Prizes for you! That’s honestly a great thing to have. My instinct for Standard is to partner him up with Buzzwole-GX, who can Jet Punch to tack on damage to Pokemon and set them up for easy Aura Strikes – just a neat interaction between the two. If you’re in need of Lucario-GX to play with, go hunting down the Lucario-GX Box – which is the only product that sells him. It was released a couple weeks ago, but at $20 a box, it’s probably worth grabbing to get all the Lucario-GX you could need. Arora Notealus: Lucario-GX is definitely one of the best promo cards released in recent memory – maybe even one of the best promo cards ever released. Although it’s hard to match up with iconic promo cards like the Ancient Mew card and the Entei movie promo, but in terms of impact, I could honestly imagine Lucario-GX, in the right build of course, topping a few events and possibly being a sleeper hit for Worlds. I don’t wanna hype him up and say he’s the next M Audino-EX surprise…but not gonna lie, he could very well be the next M Audino-EX surprise! The tools are there, and it’s gonna be great to have a promising contender in the fight to Worlds. Side Review: #9 Luxio/Luxray – as impressive as the line-up is, it’s also been a little underwhelming in the face of competition. Maybe Shinx should have had a Nuzzle attack so he could benefit from Pachirisu? And it’s hard for Luxio to distinguish himself as an Item Lock-ing master when Seismitoad-EX did it so much better back in his day. Kids these days, think they know what’s up. Next Time: And now to look up to the moon for the shining diamond inside. Lucario-GX was available in its own promotional boxes. So I hope some of you have a playset of this card if you plan on using it. A Stage 1 Fighting Type Pokemon with 210 HP, weak to Psychic, and a retreat cost of 2, it has three attacks. Aura Strike seems like a similar proposition to Golisopod-GX; an attack that costs F for 30 damage, plus 90 more damage if this Pokémon evolved from a Riolu on that same turn. Cyclone Kick does 130 for FFC. And Cantankerous Beatdown GX is a reworking of Tauros GX’s Mad Bull, costing CC and does 30 damage times the number of damage counters of this Pokémon. Cycling through Aura Strike seems a little trickier than First Impression. Whereas First Impression does 120 if Golisopod GX came from the bench into the Active during your turn, Aura Strike works only if Lucario GX evolved from a Riolu during your turn; afterwards, it’s just 30 for F. Fortunately, Super Scoop Up can cycle the entire evolutionary line to your hand so that you can evolve a different Riolu. Not only that, Devolution Spray is another method of removing a higher stage from one of your Pokemon unless your Lucario-GX is heavily damaged, in which Super Scoop Up or Acerola would be the safer choice. And Puzzle of Times ensure you get even more opportunities to using such cards. With plenty of methods, I assure you that you’ll have enough uses of Aura Strike to carry you to victory. I can see Lucario-GX being a MVP for knocking out certain Pokemon that are overcentralizing. Zoroark-GX gets chiefly knocked out by Aura Strike without any further boosts aside from having to evolve a Riolu. Even Tapu Lele-GX gets OHKOed by a combination of evolving from an Riolu, Strong Energy, and Choice Band. Picking off these Pokemon for an easy two prizes has secured its niche. And if you truly exhausted all your devolution or bouncing cards, than a nice fallback option is it’s GX attack, which takes 9 damage counters on Lucario GX to OHKO anything in the game. And Cyclone Kick is sort of there, doing a clean 2HKO under most circumstances. This card……..is not available in Limited, though it would be a must run. Notes: I’ve seen couple videos regarding Lucario-GX, with partners including Zoroark-GX or Lycanroc-GX. This is a brand new card; I’m not too certain if this would be competitive or not, but based on what I’ve watched, I say it’s functional and can actually pick up some victories, which is good enough to boost my opinion of this card. Lucario GX (SM100), hot off the presses, kicked its way into the meta just last week. It’s so new, it wasn’t even Standard legal for last weekend’s regional in Charlotte. Not sure exactly why not – I thought cards became legal on the third Friday of the month – but maybe the two week grace period overrides that? Anyway, this card has strong similarities to Golisopod GX (BUS 17) except it gets its damage boost if you evolve it in the current turn rather than promote it in the current turn. Aura Strike’s damage amount is similar, though, to First Impression: thirty plus ninety if you evolve it in the current turn. Cyclone Kick does 130 for three attachments (two Fighting, one Colorless), and its GX attack Cantankerous Beatdown GX is similar to Tauros GX’s Mad Bull in that it does thirty damage per damage counter on Lucario. I’ve seen this do well in a couple videos, and it fits the mold of a Tier 1 card. Let’s face it – Zoroark GX isn’t going anywhere for two plus years. It’s Standard legal until August 2020. A single attachment Fighting Pokemon that can OHKO Zoroark GX is going to have a place in the meta. I’ve faced it twice already, and I’m 1 W 1 L against it, but the one win was with an all Psychic deck that I’ll talk more about tomorrow. If it looks like a duck, if it walks like a duck, if it quacks like a duck, well, that means this will probably be a Tier 1 Pokemon. Much like the other Tier 1’s right now, it goes well with Garbodor BKP, Lycanroc GX, Zoroark GX, maybe even Buzzwole GX. Pretty much any combination of these Pokemon will get you a darn good deck. which can actually be taken in a variety of ways, but none of them equate to the official legality date. If they mean the “month after“, that’d be in April (March is the “month of“). March 2nd is the first Friday in March, while March 16th is the third Friday. March 23 is the second Friday after the card’s release… unless we do this weird thing where we count the day OF release as also being a Friday “after” release. So, why am I making such a big deal of this? It reminds me of how my father gives directions, but that isn’t good enough to justify such a tangent. No, I am stressing this because Lucario-GX looks to be good. Really good. So good that a cautious evaluation is me saying “Sometime within the next six months, it should have a competitive deck built utilizing it.” If I jump aboard the hype train, this is going to be the top deck in the format. I’m not going to take that ride, but it is tempting, and I think this is going to become part of at least one high performing deck. The rest of this review is going to be me walking you through why I believe such things. Lucario-GX has a LOT going for it, but we’ll start with its key feature, the attack “Aura Strike”. For [F], this attack does a decent 30 damage, but its effect increases this damage by 90 if “this Pokémon” Evolve from Riolu during this turn. It does NOT specify “from hand”, so you could open with a Wally Turn 2 (the first turn of Player 2) and slam your opponent for 120 damage. Already, Zoroark-GX goes down in one hit (thanks to Weakness), and most small-to-medium targets join it. Individually, Choice Band, a Strong Energy, and a Regirock-EX (for its “Regi Power” Ability) just mean a slightly bigger bite is taken out of the medium-to-larger Pokémon getting hit, but once they start combining, key numbers go down. Namely, Choice Band with one Strong Energy – a pretty easy combo for the typical [F] deck – swing for 170 damage. This is enough to take out some Basic Pokémon-EX/GX in one hit, like Tapu Lele-GX. You’ll NEVER reach guaranteed OHKO levels for anything and everything, but a slightly more robust combo does threaten nearly everything shy of an Evolved Pokémon-EX/GX, Pokémon with defensive buffs, or outliers like Wailord-EX. Aura Strike is a one time deal, though, right? Sort of; as is often the case, Pokémon offers some tricks that can allow you to reuse it, the three most likely candidates being Acerola, Devolution Spray, and Super Scoop Up in the Standard Format, with those being joined by AZ and Scoop Up Cyclone for Expanded play. This is a complicated enough combo that sometimes you WILL fail to pull it off, but it is enough that you should be able to replicate Golispod-GX style shenanigans. While not often relevant, another small bonus is the tricky conditions to make full use of Aura Strike mean copying the attack won’t do other Pokémon much good. Still, this is where we need to comment on the rest of the card. I’ve already pointed out why the [F] Typing is good, but I’ll remind you it is actually very good because [F] Weakness is pretty common in the cardpool, even if Resistance is relatively common as well. Some of the tricks I already mentioned only work for [F] Types and the Expanded Format offers some older combos that shouldn’t be forgotten, like Focus Sash and Korrina. Being a Stage 1 is the best option for an attack like Aura Strike, as it is still fairly fast and doesn’t eat up a lot of resources. Flareon (XY – Ancient Origins 13/98), Jolteon (XY – Ancient Origins 26/98), and Vaporeon (XY – Ancient Origins 22/98) could be used to shift its Typing in Expanded, but while I love that trick, I haven’t heard of anyone bothering with it lately, even though we’ve got multiple strong Stage 1 Pokémon capable of exploiting it. Being a Pokémon-GX comes with the usual hangups, but is why the HP and attacks on this card are so good. 210 is hard for most decks to OHKO rapidly, reliably, and repeatedly unless Weakness is a factor. [P] Weakness is dangerous, both due to existing attackers and because fellow popular [F] Type Buzzwole-GX encouraged folks to be prepared to exploit it already. Lack of Resistance is the worst, but the Resistance mechanic is pretty balanced and – sadly – often negligible. The Retreat Cost of [CC] is also typical, but a little more relevant; given the focus on Aura Strike, it is probably a good thing Acerola and/or Super Scoop Up give us an out to manually retreating at full price. Speaking of which, if the combo doesn’t materialize, we have two other attacks for Lucario-GX to use. “Cyclone Kick” needs [FFC] to do 130 damage. Ignoring the rest of the card for a moment, Cyclone Kick is a good, solid attack. Remembering the rush to use Aura Strike and how tricky it can be to quickly attach another [FC] to an Active Lucario-GX, and it might prove hard to use well. If the attack cost was [FF] or even [FCC], this wouldn’t be an issue. The GX-attack, “Cantankerous Beatdown-GX”, costs only [CC] and does 30 damage for each damage counter on “this Pokémon”. Obviously this is bad if Lucario-GX doesn’t have a decent amount of damage on itself, and it is a one time trick, but until you use it your opponent will be forced to shoot for OHKO’s, go for staggered 2HKO’s where the first shot just doesn’t do much damage, or rely on more expendable attackers. Just six damage counters on Lucario-GX will allow a Double Colorless Energy to score a OHKO against a 180 HP target. Rioulu doesn’t and the other Lucario cards don’t do much (if anything) for Lucario-GX, so let us move onto some possible decks for the card. The most obvious is a deck focused on Aura Strike and just Aura Strike. Spamming various bounce effects, maybe using Focus Sash in Expanded, should really annoy your opponent unless he or she can score OHKO’s or disrupt enough elements of your own deck. Seems solid, but not spectacular; like Golispod-GX or Zoroark-GX, we should find a dance partner for Lucario-GX, if not several. In fact, Lucario-GX looks like it would partner nicely with either of them, perhaps even both. The main drawback is that the [F] Type support that gives Lucario-GX a little extra bite is going to clash with those two. Stuff like Acerola works well for all of them, but enough stuff doesn’t overlap that Golosipod-GX probably isn’t a good fit. Zoroark-GX works with so many cards that it shouldn’t be a surprise Lucario-GX/Zoroark-GX most likely will work, and work well; it still can’t make use of [F] support, but it can be an attacker or a Bench-sitter and is less picky than Golisopod-GX. Another obvious approach is just slapping together a mostly or mono-Type deck around Lucario-GX; Buzzwole-GX and company play well with each other and with Lucario-GX. Buzzwole-GX can soften up some of the larger targets for Lucario-GX, and can take advantage of bounce tactics as well with its 190 HP and single Energy requiring “Jet Punch”. Both Garbodor (XY – BREAKpoint 57/122) and Garbodor (SM – Guardians Rising 51/145) could be combined with Lucario-GX. While I’ve mentioned supporting Lucario-GX with some Abilities, most of those are optional or – like Tapu Lele-GX – the kind that can coexist with such decks due to their timing. Shutting down Abilities won’t hurt the Aura Strike strategy, so it ends up helping it as various possible counters to a steady stream of 2HKO’s and regularly bouncing your attacker are preemptively disabled. So the older Garbodor is a pretty natural fit, but what about the “Trashalanche” user? Even though some of the same problems will occur that led me to dismiss partnering with Golisopod-GX, the combination of sharing resources with the older Garbodor, being a single Prize attacker, and punishing Item usage are enough of a net positive that I still have high hopes for such a pairing. I’ll also bring up something I have not seen elsewhere: Vileplume (XY – Ancient Origins 3/98). The short version is that, while you’re giving up access to Items for yourself as well as your opponent, you can try to drop Focus Sash on some Riolu early, making OHKO’s almost impossible until your opponent triggers them all to be rid of them.